Beside plaid prints, sequins sets a holiday spirit...who doesn't want to sparkle and shine this holiday party?! 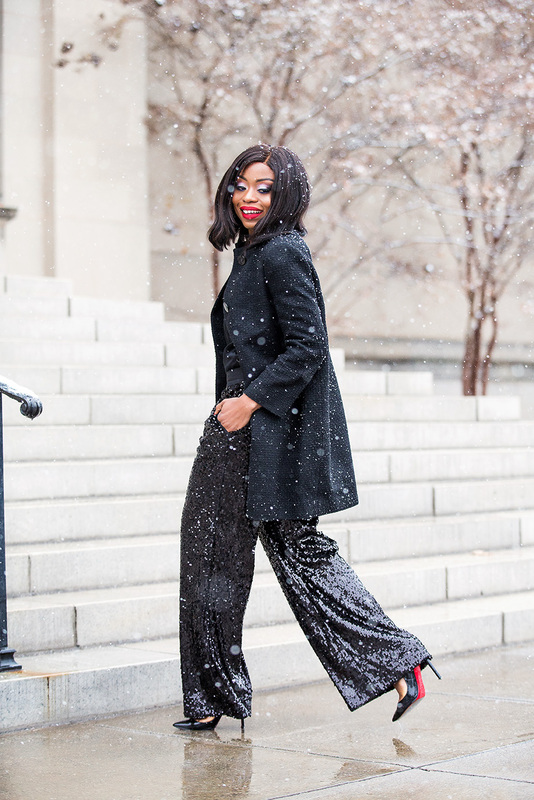 This palazzo sequin pants is a must-have for the holiday season. The wide leg, side pockets and comfortable waist band are some of the things that made me fall in love with it. Instantly, I thought of creating a glam look for the holiday. Creating a holiday glam look in sequins is very simply. Pick a sequin pants or leggings, add a black blouse or cami top -- preferably a silk or velvet for a glam appeal. I choose to pair it with a lace cami top for a feminine feel. I completed the look with a tweed jacket (previously worn here) and classic black pumps. You can't go wrong with an all black look. The different textures adds uniqueness to the overall look. This look is ideal for a work holiday event.